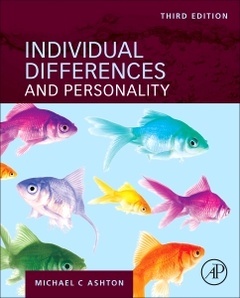 Individual Differences and Personality Ashton Michael C.
Auteur : Ashton Michael C.
Individual Differences and Personality, Third Edition provides a comprehensive overview of research on personality. The book begins with the main approaches to the study of personality, basic principles of personality measurement, the concept of personality traits, and the major dimensions of personality variation. Further chapters review personality change and stability, biological causal mechanisms, genetic and environmental influences and evolutionary adaptive function. Personality disorders are examined as are life outcomes?such as relationships, work, health, and others?that are predicted by personality characteristics. The book additionally examines important individual differences, such as mental abilities, vocational interests, religious beliefs, political attitudes and sexuality. The third edition is updated with new findings on age-related differences in personality, on sexual orientation and personality, on socially desirable responding in personality assessment, and on the biological and social origins of mental ability differences. Treatments of several topics have been streamlined, including reliability and validity, developmental change, genetic and environmental influences and the structure of mental abilities. Students, instructors, and researchers in personality psychology. Michael C. Ashton is a professor of psychology at Brock University in St. Catharines, Ontario. He received his Ph.D. from the University of Western Ontario in 1998. As a grad student in the late 1990s, together with Kibeom Lee, he did some cross-cultural research to find out whether the “Big Five personality dimensions found in North America could be recovered in other cultures. Using their own work and that of other researchers, they found that there were actually six personality dimensions. The “new one was the H factor, or the Honesty-Humility Factor, was discovered and is now considered one of the six dimensions of human personality. In addition to the second edition of the textbook, Individual Differences and Personality, he is the author of numerous articles in scientific journals, and co-authored with Kibeom Lee The H Factor of Personality.